When it’s time to eat, the park offers everything from meals to fit the most austere budget to fine dining. Unless you’re planning a meal at the Prince of Wales, dress code in park restaurants is casual. If you plan on cooking your own food, stock up before you get to the park. Groceries are available at the Rocky Mountain Food Mart (Windflower Ave., 403/859-2526, 8 a.m. to 10 p.m. daily). Why is this important? The internet is overflowing with restaurant review sites, most of which are filled with content supplied by the restaurants themselves (although you’re never told that) and then opened to user comments. On this site, at every restaurant you see this symbol, you can be assured our review comes from personal experience. We live here. We dine out here. We have no affiliation with any of these restaurants. They have not paid to be included. We recommend them simply because we feel they are the best places to dine in town. Waterton has a smattering of coffee shops and small cafes. Waterton Bagel & Coffee Co. (in the theater building on the corner of Windflower Ave. and Cameron Falls Dr., 403/859-2211, summer 7 a.m. to 9:30 p.m. daily) brews up the best coffee in town. It’s a hole-in-the-wall type of place, but well worth searching out. Open: summer 5 to 10 p.m. Mon. to Fri., noon to 10 p.m. Sat. to Sun. Pizza of Waterton dishes up the best—0kay, the only—pizza in town. It’s actually pretty good, piled high with toppings of your choice. A 12-inch (good for two) costs from $25, beer is $6, and there’s a choice of wines for under $30 per bottle. Eat inside, at the picnic tables out front, or take your order back to your campsite. Along the main street, the selection of places to eat is varied, but none are outstanding. If you’re looking for a decent family restaurant, Zum’s is a good choice. The burgers are tasty and come in all forms (including with buffalo patties) for around $10, with fries extra. The dinner menu includes varied preparations of chicken, seafood, and beef for $16 to 33. Wash it all down with a milk shake ($6). The Kootenai Brown Dining Room has predictable hotel dining, with a menu to suit all tastes. The lake views through the dining room windows make this place that much more enjoyable. In July and August a breakfast buffet costs $20. The big windows at the Royal Stewart Dining Room, a formal restaurant in the Prince of Wales Hotel, allow you to gaze down along Upper Waterton Lake while soaking up an old-world elegance unequaled in the park. A simple breakfast buffet every morning (6:30 to 10 a.m., $21 per person) is worth attending for the views alone. The rest of the day, the menu is mostly old-fashioned, but with choices like charbroiled pork chop smothered in a Saskatoon berry and gorgonzola sauce, no one complains. Prices are similar to any big-city restaurant of the same standard–for dinner, expect to pay around $160 for two without alcoholic drinks and tip. If you are going to splurge, do it here. Afternoon tea ($40 per person) is a tradition at the Prince of Wales Hotel, but it’s an overpriced one. Still, it’s popular, especially with the tour-bus crowd that stays at the hotel as an extension of a tour through adjacent Glacier National Park. Sure, it’s tasty and memorable–think finger sandwiches, pastries and cakes, tea, coffee, and other beverages served up on white linen at tables with the best view in town—but it’s not cheap. 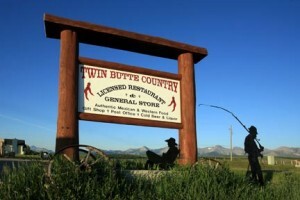 You’ll pass Twin Butte Country General Store on the road between Pincher Creek and the park. Rather than just a general store as the name suggests, it is home to a friendly little cafe serving up inexpensive Mexican dishes and local specialties such as elk burgers.